An article on the website of Wired magazine, of all unlikely sources, reminded me of the most recent coffeetable-worthy church building catalog published at the beginning of last month. The book in question is entitled Closer to God edited by Robert Klanten and Lukas Feireiss. I do not yet have a copy, so I cannot provide a review; but let us hope that the book itself contains more insight into the motivation of religious architecture than the merit-based votive self-preservation suggested by the article on Wired. The Wired article also features some nice photographs of San Paolo, Foligno designed by Massimiliano and Doriana Fuksas. By way of a follow up to out post on Architecture in Parish Closures: St James, Lakewood, I have just discovered this book, published in June. Cleveland's Vanishing Sacred Architecture documents the sacred architecture and art of churches in danger of closure. The authors highlight the cultural diversity created by immigration which gave rise to an architectural diversity which is now, presumably, less desirable. This title is now available through the Locus Iste Bookstore. Fr Uwe Michael Lang's Turning Towards the Lord: Orientation in Liturgical Prayer is a very highly recommended book dealing with the true reasons behind what is a widely misunderstood and often contentious issue in church architecture and in the liturgy in general. 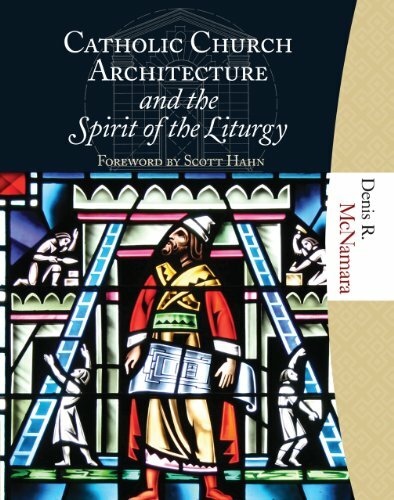 Today in the mail I received a copy of Denis R. McNamara's Catholic Church Architecture and the Spirit of the Liturgy (thanks to the in-laws for a wonderful graduation present!). If you are not familiar with the book, which came out late last year, it is one of the more substantial works on church architecture of the past few years. When the book was first announced, I was very excited because in the press materials (and on the back of the book) it announced that it "intended to find the middle of the road between differing and sometimes conflicting theories of liturgical architecture." This was exciting because no one seems to be looking for this. If these pages [locus iste] have an editorial stance it is that the perceived conflict between so-called traditional and so-called modern must be abandoned. You will understand my disappointment when I learned that McNamara turned out to have a vested interest in a single architectural expression (or style) when I discovered this utterly inconceivable article wherein McNamara claims that the classical is the only tradition which could fulfill the theological aesthetics of Hans Urs van Balthasar. Now, I have not read all of Balthasar (if that is a feat attainable by mortal men), or indeed the whole of Herrlichkeit. But from my readings so far it seems to me that to make such a claim is precisely counter to Balthasar's project. That a species is beautiful because of the lumen of which it is revelation does not require that said species is the only one through said lumen could be revealed (see GL1.118 and also GL1.25 on the importance of letting go of and not overvaluing specific secondary forms that, like Classicism or Gothic, could be "regarded with suspicion as belonging to an ideology"). Were it true that there could only be one Gestalt per Ganz, how could we talk of the church as "the body of Christ" when the form is clearly different. The multiplicity of forms of the one splendor of the body of Christ is one of greatest strengths of the church. It often seems that it is all that keeps her from utter ruin amidst the volatility of humanity. The middle road, it seems, is not the answer; we must rather abandon roads altogether. But it is still an impressive volume, in its omissions as much as its substance, and I will review it here as I work my way through it soon.